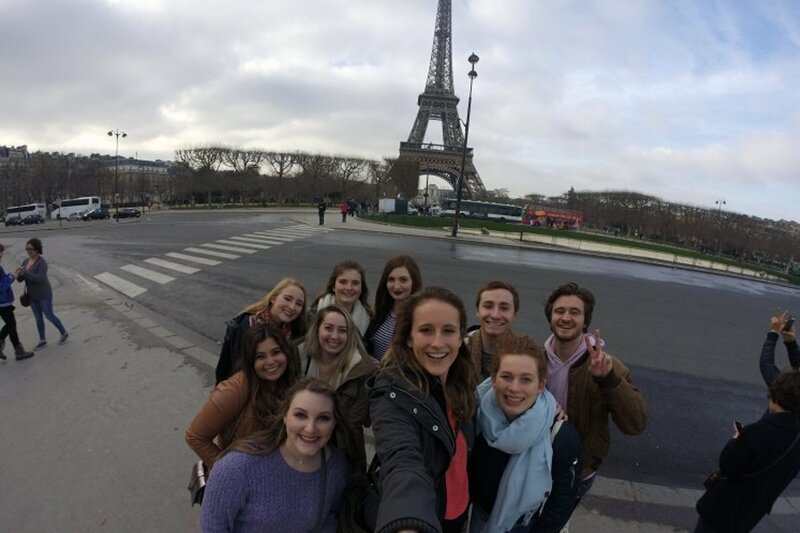 On nearly every USAC study abroad program you participate in, we organize field trips and tours to provide a well-rounded study abroad experience. Sometimes the field trips are included in program fees and other times they are optional tours that cost an extra fee but are well worth it. 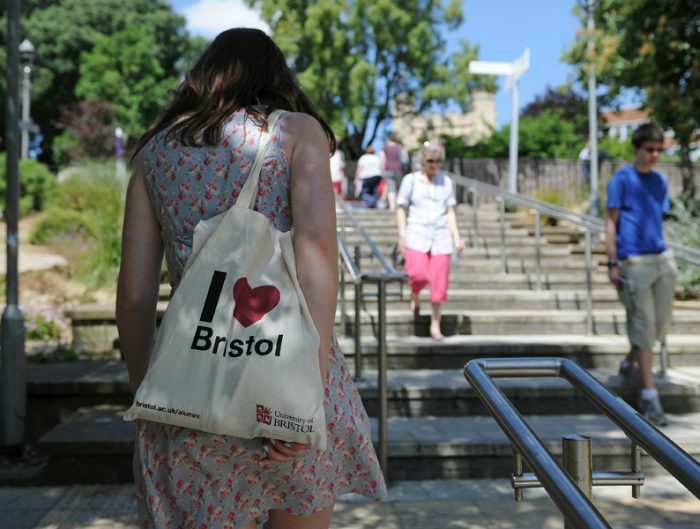 For students studying abroad in Brighton, England we offer an optional tour to Paris. 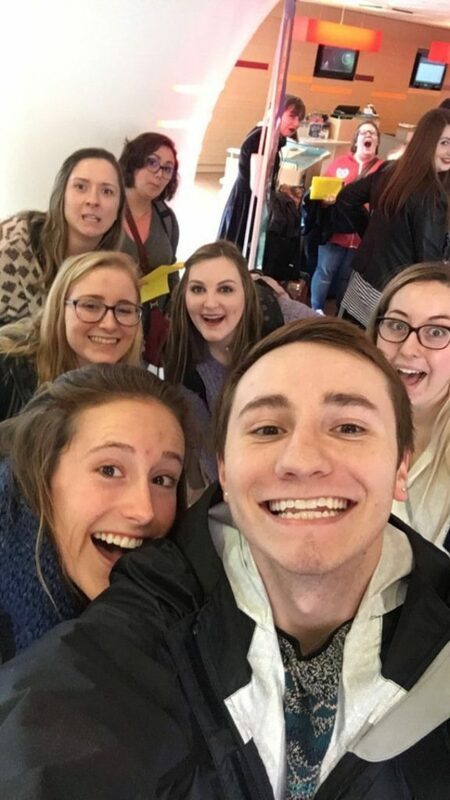 If you’re wondering what an optional tour is all about, a student studying abroad in Brighton for Spring 2017 wrote all about it on his blog. You can read his experience below. 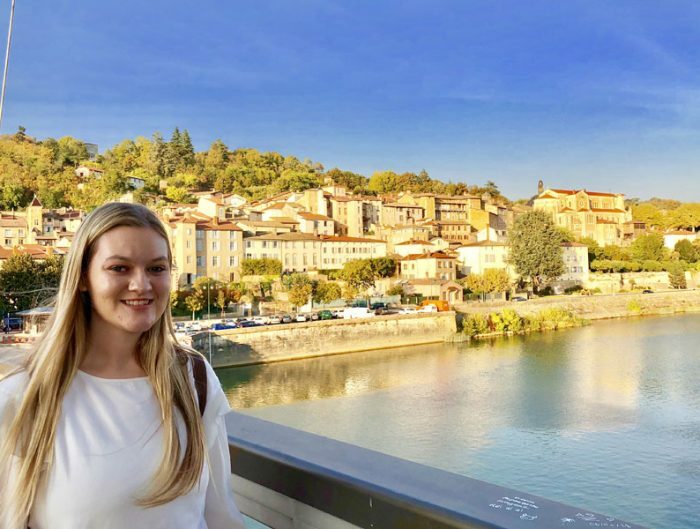 Adjusting to the study abroad lifestyle has been crazy and I haven’t had too many adventures yet that I felt were worthy of blogging about. 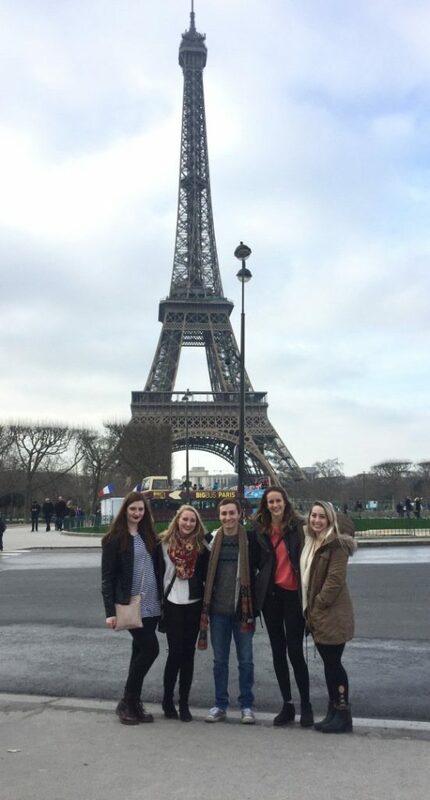 However, that all changed last weekend when our study abroad group took a weekend trip to Paris, France. 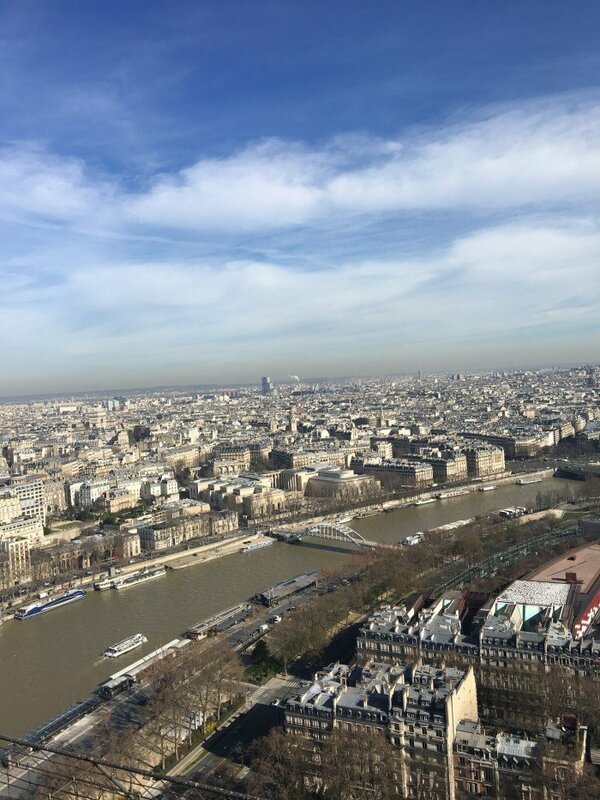 It was a crazy weekend that included a view from the very top of the Eiffel Tower, a tour of the very lowest part of Paris in the catacombs, getting my iPhone stolen on the subway, and a million things in-between. The day started with a coach bus picking us up at our campus at 6:00 am on Friday morning. Although we were exhausted, everyone was in a great mood and very excited about our upcoming adventure to the City of Love. 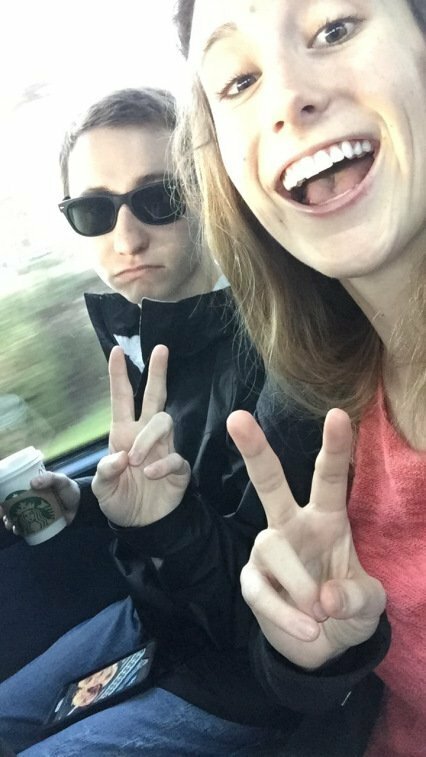 We hopped on the bus and drove for about an hour and a half before stopping for a coffee and bathroom break (yes it’s true that we college kids love our coffee okay it’s a necessity). 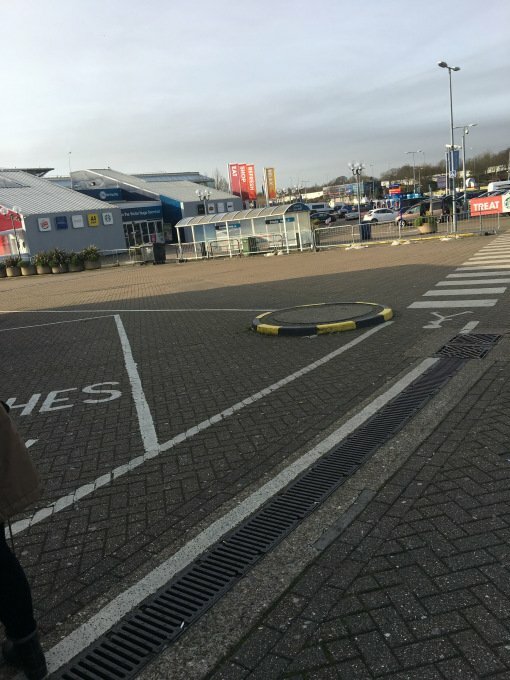 We drove for about another hour before arriving at the Eurotunnel station. For those who don’t know, the Eurotunnel is basically a tunnel that was built under the English Channel so that people can get from England to Paris quickly and easily. Basically, you drive your car/bus onto a set of tracks and put your vehicle in neutral so that you can easily ride along for the 35-minute ride without having to drive for yourself. It was actually really cool and I guess being in a small space made everyone crazy because we were all super hyper. Which was also very fun. 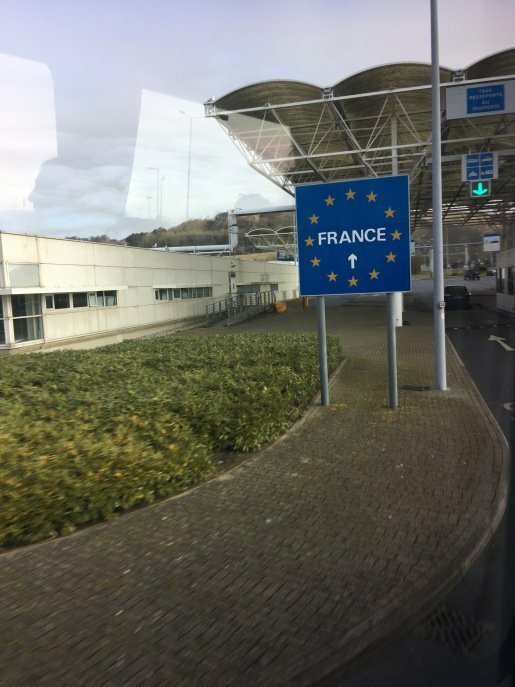 After a 35 minute drive, we emerged out of the tunnel and were suddenly in Calais, France, which was pretty trippy at first because the drive was so short and next thing you know we were in another country! Initially, it didn’t look very different from England so it was kind of hard to wrap my head around the fact that we were really in France. At this point, we had almost a 4-hour drive to Paris from Calais and the exhaustion finally hit, so everyone just chilled for the rest of the drive. After what felt like forever, we were finally in Paris. It was pretty obvious that we were there because you can see the Eiffel Tower for miles. Incredibly, our hotel was only a few blocks from the tower and we drove right by it on our way to check in. We checked into our hotel around 3:30 pm and had about a half hour to freshen up and get ready the evening. 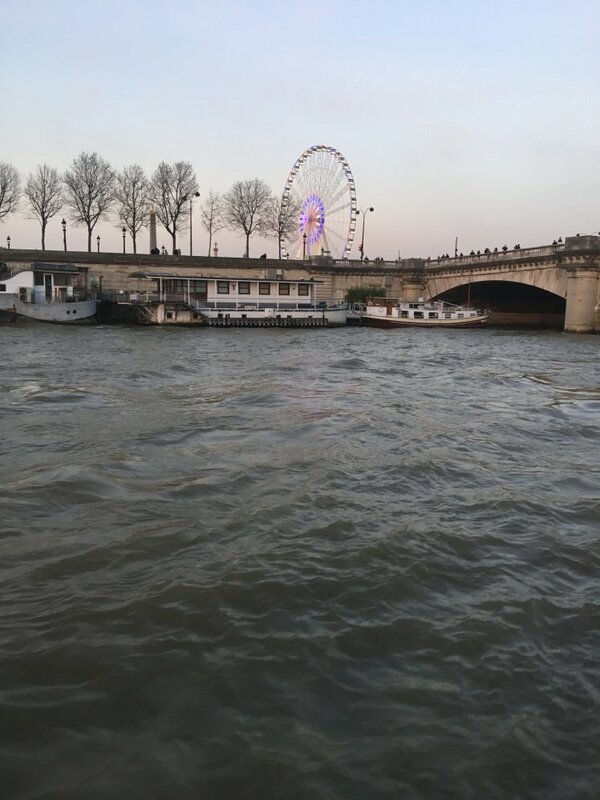 We were going to be walking to the Eiffel Tower to take some pictures and then catching a boat ride on the Seine River to get a view of Paris at sunset. Once everyone was down in the lobby and ready to go, we walked the few blocks to the tower and instantly freaked out when we finally got to see it in person. Being there next to the Eiffel Tower was one of the most surreal moments of my entire life. I have always dreamed of seeing it but never really thought that I would actually have the opportunity. I just stood there for a good five minutes, marveling at the architecture and beauty of this breathtaking monument. I expected it to be big but wow, it was so enormous. It was a real bonding experience for all of us because I think that this was a dream everyone in our program had. It was a moment of clarity almost, the realization that we were in Paris, France, traveling the world with great people and watching our dreams flesh out in front of us. It was definitely a moment that I will never forget. Once everyone was satisfied with the pictures taken in front of the Eiffel Tower, we walked a few more blocks to the dock where our boat tour was supposed to start. We ended up having a little bit of free time before we were able to load the boat, so everyone kind of went their separate ways to pass the time. 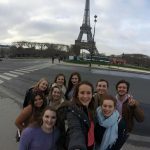 The group that I stayed with sat in front of the Eiffel Tower and marveled at it for a little while longer, and enjoyed each others company. Finally, it was time for us to load the bus, which was to take us down the Seine River during sunset to enjoy the view of Paris. It was so gorgeous and definitely one of the most memorable parts of our trip to Paris. 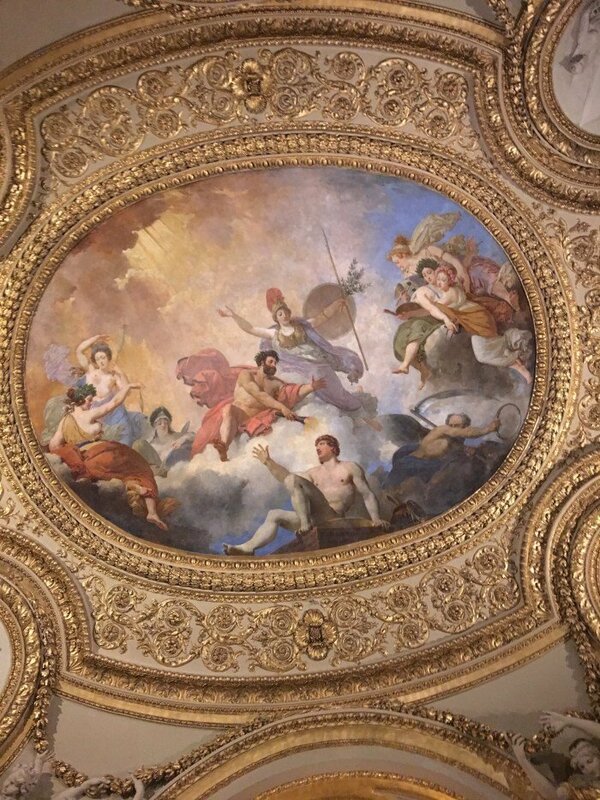 After the boat tour, a group of us went to the Louvre and checked out some of the art in the museum. 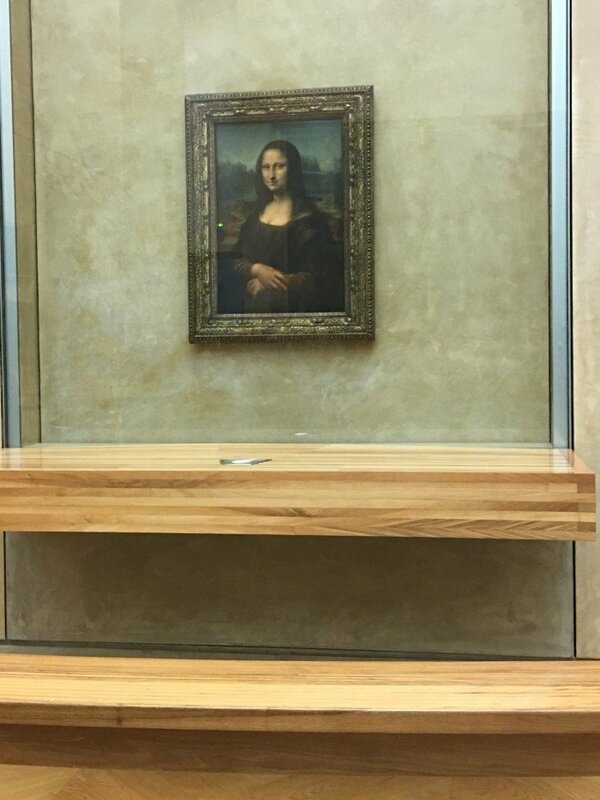 We got to see the very famous Mona Lisa (which was not as big as you would expect) and some other really cool paintings and statues. The next morning we had an early start as well. We met in the hotel restaurant and had an incredible breakfast of cheese and bread (and other things but really all that matters is cheese and bread). We walked back to the Eiffel Tower and had an opportunity to buy a ticket to go to the very top, which was one of the scariest and coolest moments of my life. 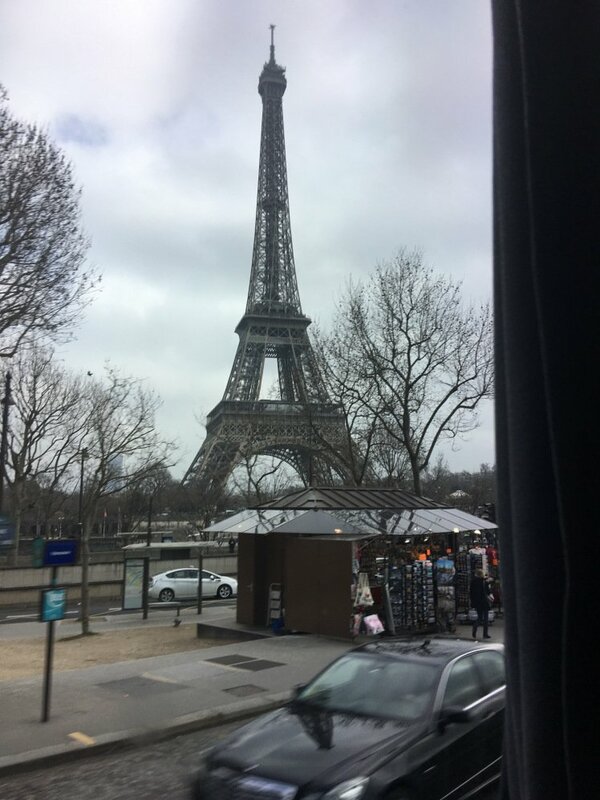 After we left the Eiffel Tower, we had a bus tour around the city where we drove to the most famous (and touristy) parts of Paris so that we could at least get a glimpse of all of the “must see” places that Paris has to offer. 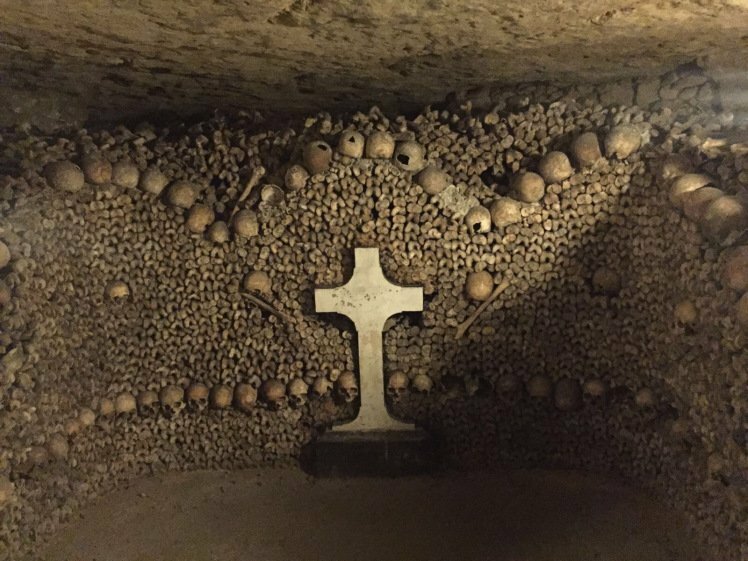 After the bus tour, we had some free time, and a big group of us decided to check out the catacombs in Paris. 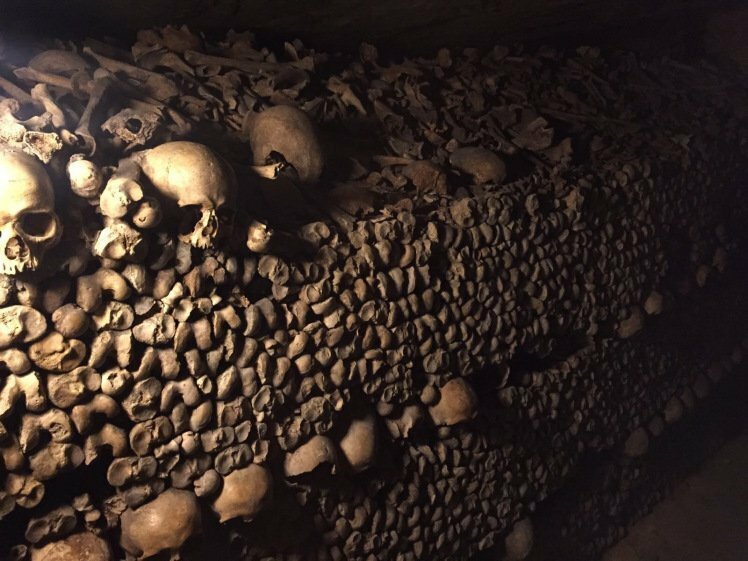 The catacombs are basically a system of underground tunnels under the city that are over 45 million years old. During the 1800s, skeletons were stored down there as the graveyards began to get too crowded. It was extremely creepy and is supposed to be one of the most haunted places in the world. 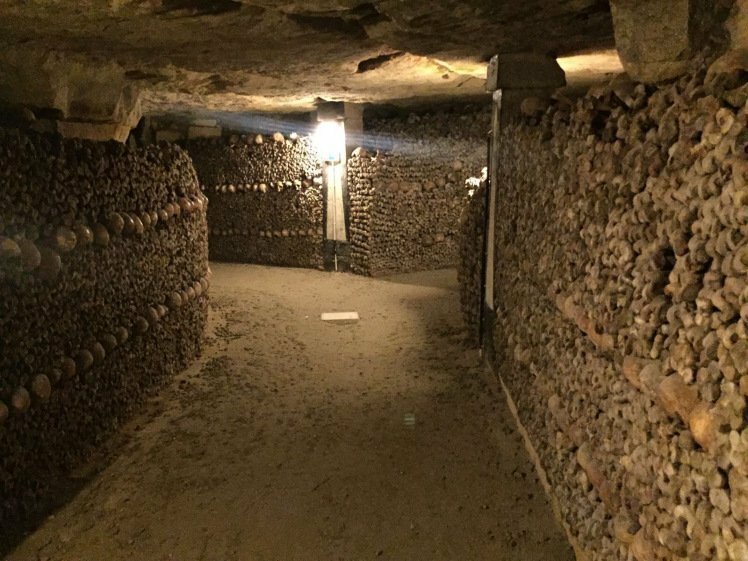 There are over 100 secret entries all around the city of Paris and supposedly, there are people who have found them and use the catacombs to perform dark magic. I can see why some people are afraid to go down there because it gave me a very strange feeling that I have never felt before (but because I love being scared and I think haunted places are super cool, I was so intrigued). It was about a two-hour wait to get into the catacombs but it was so worth it. 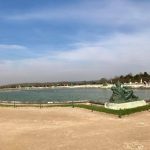 Anyone who is going to Paris, this would be my #1 recommendation for you to check out while you’re there. The pictures below are just a sample of the 6 million bones that are stored under the catacombs. I told y’all it was creepy. Our last day in Paris was another early morning. 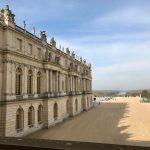 We were going to spend a few hours at the Palace of Versailles where King Louie and Marie Antoinette lived. It was one of the most grandiose places I have ever seen in my life. 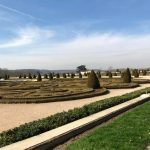 There were tons of bedrooms and sitting rooms and dining halls and the most magnificent garden I have ever seen in my life. As much as I would love to live in a place like the palace, I honestly think I would get overwhelmed by how massive it is. But hey, I guess that’s how the royal like to live. 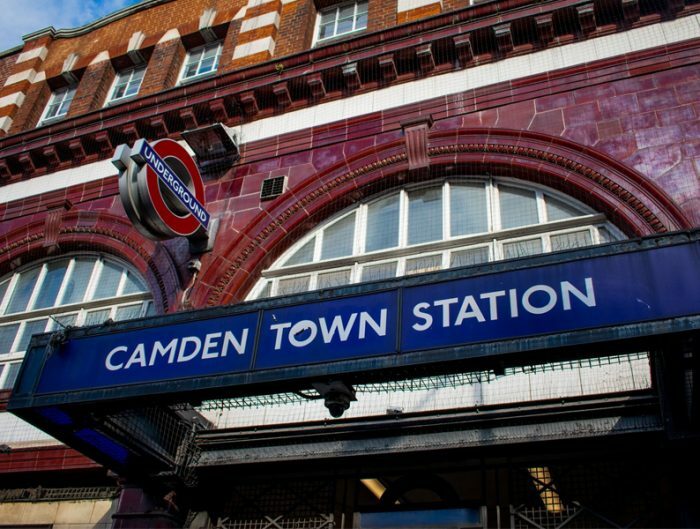 Sadly, this was the last stop of our trip. After we left the palace, we began the long drive back to Brighton, England. 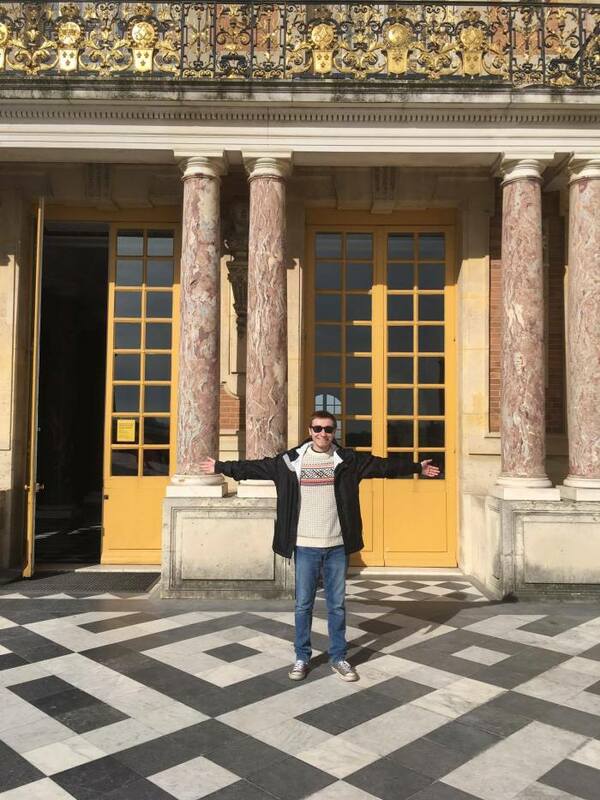 Although getting my phone stolen was super inconvenient, overall I still had an amazing time in Paris and I really hope that I get to go back some day. Follow your dreams kids! Sometimes you’d be surprised about where you end up. 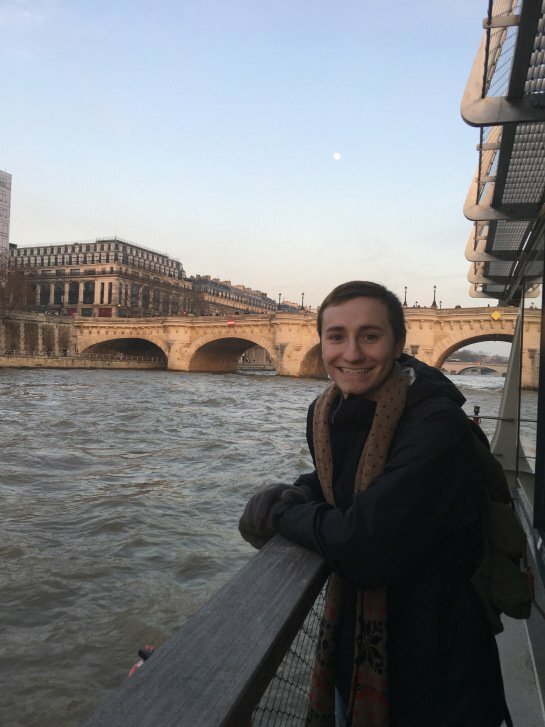 Wesley Alexander is a student at West Texas A&M who studied abroad in Brighton, England in Spring 2017. Hear more about Wesley’s adventures in Brighton on his blog, It’s Wessums.